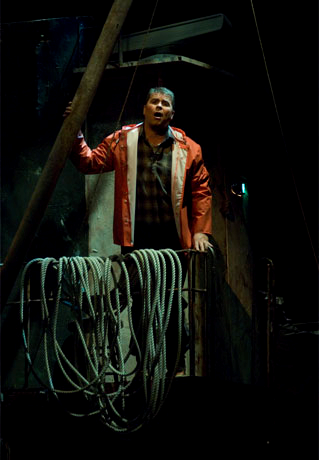 "It means a lot to me to get to Seattle and make a debut here," says Jason Collins, a young tenor at the dawn of his opera career singing the role of Steersman in Seattle Opera's production of Wagner's "The Flying Dutchman." "This is an A-level house. People look to Seattle to set really high standards, particularly in Wagner." Collins, from South Carolina, was one of eight finalists in last year's International Wagner Competition hosted by Seattle Opera, and this is his first appearance in a major opera house. He had already come to the attention of Speight Jenkins, Seattle Opera's general director, but it was after the competition that he was contracted to sing Steersman, and he has also been chosen to sing Froh in Seattle's 2009 production of Wagner's "Ring" cycle. With a "Dutchman" cast which includes experienced Wagner singers like Jane Eaglen and Greer Grimsley, Collins says the more he works with them the more he learns. Stage director Stephen Wadsworth, he says, is a genius and a great educator. "He wants (the production) to feel real, and he has a way of bringing that realness out. He'll say 'Let's tell a story with your body. The only way you are going to move people is by being real and vulnerable.'" Collins, 34 (young for a Wagner singer), is still finding it hard not to think of himself singing as a student to someone who is there to judge. Wadsworth told Collins to sing as though the curtain was down, as though no one was listening. "I got so much out of that and I started to enjoy the audience," he says. "Everyone in 'Dutchman' is longing for something, and it's that longing which the Steersman has to set the stage for. Stephen wanted a quiet aloneness. The Steersman sets up this simple, naked longing, and then the Dutchman comes along with his much more complex longing, and I, the Steersman, feel a kinship with him. I foresee trouble and I drink to avoid it. That's what Stephen wanted me to convey." Collins has sung the Steersman before, but not like this. "I was just a crazy man in a previous production. This Steersman is human, someone you can identify with. That's what's brilliant about Stephen. People come to the opera to escape their lives, but then they see they are not alone." Another person he's learning from is conductor Ascher Fisch. "He hears the music, he understands it, he could stage direct the opera just through the music," he says. "He knows how to ask for the right (vocal) colors. He creates an experience, wants you to find out why Wagner wrote it like this. "Working with them all together is priceless," says Collins, who, after six performances, is still excited, the words tumbling out of his mouth with enthusiasm for what is happening here. "We are all a big, functioning family. We argue, celebrate, make mistakes." A couple of years out of formal schooling, Collins is being careful not to overload his voice. His is a heldentenor -- a voice with characteristic brilliance, power and endurance suitable for Wagner -- but it is still maturing, and he does not want to take on heavier roles too early and burn out. He credits his experienced agent, Caroline Woodfield, and a team of advisors for seeing that he doesn't sing those roles too soon. It's no hardship for him to wait to sing Lohengrin and Parsifal, or big Richard Strauss roles, for which he is developing his highest register. "I'm happy to look at anything. I adore Monteverdi, I want to sing 'Messiah,' Handel opera, Mozart, Beethoven's 'Missa Solemnis.' I have the agility to sing coloratura. I'd love to sing Tamino (in Mozart's 'Magic Flute') while I'm still young." But for now, he says, he is taking away a vast amount of new knowledge from his "Dutchman" experience here, plus a sense of luck. He describes his voice as "a gift bestowed on me, and with it comes the responsibility to take care of it, to sing and to enjoy it. I can always strive to be better." Freelancer Philippa Kiraly has been writing on classical music in Seattle since 1991.